Q. This blue one is so pretty! Is it real? A. There are no blue plumerias. Run, do not walk, from anyone selling you a blue plumeria. You have our permission to tell them their pants are on fire. eBay sellers are notorious for this. Q. 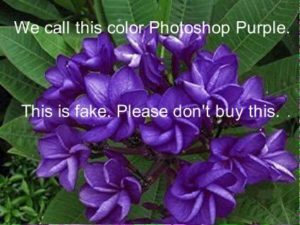 Are there any purple plumerias? A. This is a stickier question. There are some varieties (Black Purple, Purple Jack, Viola G) that are the closest thing to what we call purple; however, purple snobs point out that without a true blue, you can’t really have a true purple and those are shades of magenta. No plumeria has the deep, true purples that we find in irises or pansies. Determine how much of a purple purist you are, and buy your purple varieties in person. Make sure your heat and growing environment matches the grower’s, or you may not get the same colors. Q. How about black plumerias? A. No pure black, but there are some deep reds that can get close to black in intense heat. But if someone’s trying to sell you a black plumeria, again, run away from them. Q. I bought this beautiful orange plumeria, took it home, and when it bloomed the following year, it was just yellow. What gives? A. What’s your growing environment like? A lot of the more intense oranges and reds require intense heat to bring them out. If you purchased a plant someone had in a hot inland greenhouse and moved it to a more moderate coastal environment, you may never see those intense oranges without getting your own greenhouse. If you can, always ask how and where the plants were grown when you buy them so you can set your expectations for color in your own environment. Q. I bought a cutting that was supposed to be red and it’s blooming yellow. The seller is telling me that my fertilizer must be off. What should I be using? A. Sorry, there’s no fertilizer in the world that will make a red plumeria bloom yellow. Heat can affect intensity of a color, but it won’t change the base color. Q. What’s a NOID? I see this everyone online. A. It’s an abbreviation for “no identification.” It means the owner doesn’t know the cultivar name. A. Inflo is short for inflorescence, which is the entire cluster of blooms at the end of a stem. It’s how plumerias bloom. The stem is actually called a peduncle, if you needed trivia for the day. Q. Here is a picture of my NOID plant. Can you tell me what it is? A. Unfortunately, probably not. There is more to identifying a plumeria than one photo can tell: scent, growth habit, leaf shape and color, keeping quality of the blooms, bud shape and color, and so on. The best bet to get anything identified is to come to one of our meetings with a bloom in hand and lots of photos of the plant. But we generally can’t identify something from a photo. Q. But my plumeria grower friend looked at one of my plants that wasn’t even blooming and told me it was a Celedine. How so? A. You have a great friend! Celedines, the common yellow used a lot for leis in Hawaii, have one identifying feature. If you look at the back of the leaf, you will see a double vein running along the edge. Only Celedines have this. Celedines are a great variety: they smell fantastic, they’re easy to root and grow, and they will thank you with a ton of blooms. It’s what we recommend newbies start with. Q. I want to get started in plumerias and seeds look like the cheapest things to start with. Do you have any [variety] seeds? A. Plumeria seeds are not true to the parent. A lot of newbies get confused when they see seeds offered because the seed will have a parent plant name on it, so they assume it’s like going to the nursery and picking out a packet of seeds off the shelf. It’s not anything like that. If you see seeds with a name, the name given is the plant the seedpod grew on. That’s no guarantee that it will look anything like that parent plant. Seeds are a lottery: you may get all whites, non-bloomers, and new color combinations that do not look anything like the parent plant. Maybe you get something like; maybe you don’t. [It make take you years–like three or four or seven or twenty–before the first bloom.] Seedlings are where new varieties of plumerias come from, and many people find it extremely rewarding. But don’t buy a ‘Penang Peach’ seed if you want a ‘Penang Peach’ plant–buy a ‘Penang Peach’ plant or cutting. Q. Can you tell me when your next meeting in Anaheim is? A. We’re based in San Diego, so you have us confused with our lovely sister society, the South Coast Plumeria Society, based on Orange County, CA. Q. How can I register a plumeria? A. You can talk to the Plumeria Society of America. Q. I’m visiting San Diego and I’d like to buy a plumeria while I’m there. Can you give me a list of nurseries? A. No, sorry. Our goal for our sales is that the plants should be healthy and rooted enough that a newbie can make them thrive. Because the quality of plants at nurseries we’ve seen varies (and can vary at the same nursery year-round), we don’t maintain a referral list. Q. I’m looking for a [specific variety]. Do you know who sells that? A. No, sorry. We’re a plant society, not a grower, and there’s no way we can track the inventory and quality of all the growers in the area. Q. How much does it cost to attend your meetings? A. All of our meetings and events are free and open to the public with the exception of our October members-only luau. Q. I can’t make a meeting. Do you record them so I can watch it later? A. Unfortunately, no, we do not record presentations, and we ask that any recordings only be used for personal use and not publicly distributed. To record meetings, we would need legal permissions paperwork from our presenters and attendees, the professional recording setup, and the bandwidth to distribute the videos. We have none of this at this time. We do offer extensive minutes from our meetings in our members-only journal.